Driveby Andy: Back at it. Work on the van had halted. I've been really into the idea of a small motorhome. Something I can stand up in and that gives me the extra foot or two in width compared to the van. But really about the same length as the van. I've got a couple I'm quite interested in, and in theory could afford, but I'd be spending all of my money and that idea scares me. This afternoon I put some gear oil in the rear diff on the van. Didn't fix the noise. I'm not completely sure where the noise is coming from. But in driving it around and everything I decided I'd stick with the van plan for now, as it's all I've got right now. I ended up buying some more screws, one sheet of plywood for the top of my bed, and 4 sheets of 1" foam insulation with foil on one side. Definitely been up in the air on the insulation issue but again, I've decided to just to SOMETHING. It seems the walls will now be a layer of Reflectix by the outer skin of the van, and then the 1" foam with the foil facing towards the inside of the van (not sure if that's the way it should be, but I figure foil facing foil would be pointless too), and then 1/4" plywood. 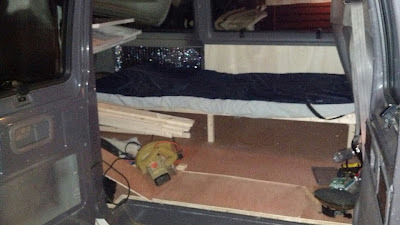 It was getting dark by the time I got home so I just got a little bit of the foam insulation put in and covered with plywood in a small section I had already been working on next to the bed. I got the piece of the plywood for the top of the bed cut, and that was it for the night. My bed is kind of flimsy and I didn't plan it out. Just built it as I went. But it did support my weight for the minute I laid there tonight. And then I put an old hospital mattress that I got for free from my friend's neighbor a few years ago on it. The mattress itself is quite heavy and I don't like it for that reason. BUT, even with that and myself it held up. Was a little wobbly but I still need to secure the bed and add a bit more support. So, if you can excuse the blurry phone picture (it was pitch dark), then here is a small picture update. Ankle update: Still hurts, and is a long way from being healed. The bruising has all finally gone away this week and I've stopped using my air cast, but really should get some other kind of support before I twist it again.